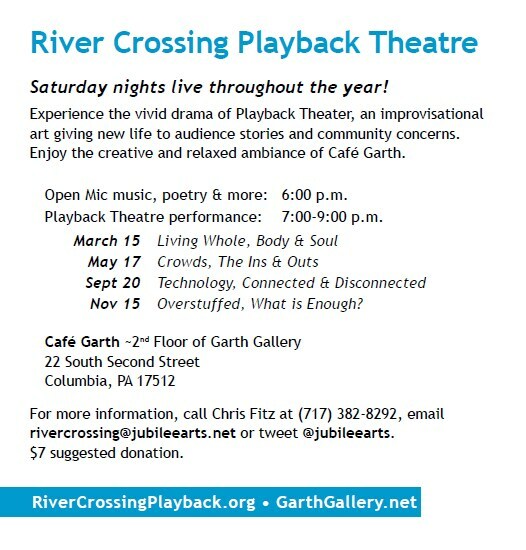 For the second year, River Crossing Playback Theatre begins its season at Cafe Garth in Columbia, PA. This year though, we have a slate of public performances that touch on some key timely cultural issues. I admit, in the beginning, i was impatient to tackle the toughest work. I got into interactive performing arts originally to work on “important” crises: bridging racism, transforming conflict, and healing from violence and trauma. You could call it, moth-to-flame syndrome. Or ambition. In the first story of the first Playback performance I conducted, a woman told a story about how her husband’s grandmother had been murdered and she’d found a measure of redemption in the most unlikely place–a movie theatre. While the freshly trained ensemble played it admirably, key pieces were missing, especially from my conducting. A respected performing artist in the audience, who’d experience the tragic loss of a family member, later shared with me that he was disappointed and didn’t see how such an art could hold this kind of trauma in a public space. 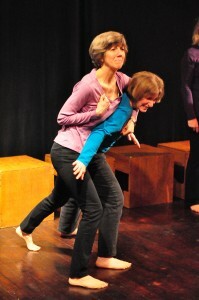 Ten years later, i continue to gain sobriety about the challenges we face when we apply improvisational forms to a community experiencing myriad potentially traumatic personal histories. On the other hand, i see how it works, how traumatic histories get re-written, re-arranged and re-formed into empowered stories. But whether i liked it or not, the collective training of our ensemble determined how far we could sustainably venture into such fast-moving waters. And for much of our beginnings, River Crossing did not have a critical mass of continuous, highly trained players. Not until recently. Now River Crossing Playback has four conductors in six core troupe members, all with 2+ years of training. River Crossing Playback is stepping out or back into its native territory–the bridging of vital community gaps. Sure, we’ll still be funny…i hope. And sure, we will play whatever story is right for the moment. But our themes, playful in 2013, now venture into deeper–perhaps faster moving–waters. Perhaps. Because while i still feel the gravity of these bigger issues, i’ve also been changed by the subtleties of this craft. I’ve come to realize that even seemingly benign stories about seemingly uncontroversial issues can hold a hidden potential for enlightening their teller–and the audience. Story by story, we find ourselves becoming more whole, present, alive. As a result, I’ve become more patient with our troupe’s progression toward “hard stories,” because the journey with all its “little” stories has already been profound. I hope you can join us for these performances. Lend your voice in what is becoming a community dialogue of concerned fellow river crossers–those willing to step outside their comfort-group and engage in an active telling of community in Central Pennsylvania. The ensemble performs in “River Side Stories” on four Saturdays in 2014 at Cafe Garth, 22 South Second Street in historic Columbia, PA. A diverse Open Mic hour opens at 6 pm, and the Playback Theatre performance begins at 7 pm. $7 suggested donation at the door. This entry was posted in Muse and News and tagged Performing, Playback Theatre, River Side Stories, Trauma on February 19, 2014 by chris.